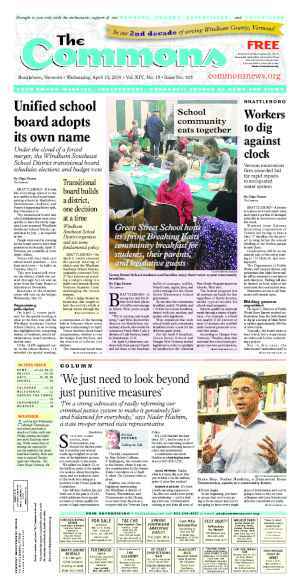 BRATTLEBORO—After many meetings and deferred decisions, the Selectboard approved almost $600,000 in budget reductions during a special board meeting before a full audience on Tuesday night. Most of the cuts came from salary reductions and a 1-percent reduction in some departments’ operating expenses. Department heads cut some equipment funds, warning that should computers or other equipment break down or wear out, money to repair or replace them might not be available. The board agreed with chair David Gartenstein that cutting individual staff jobs was too painful. 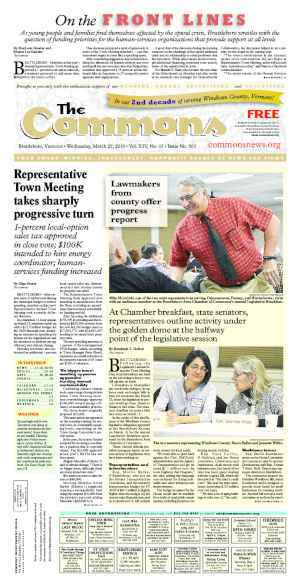 The municipal budget was defeated in a special townwide referendum after it passed at Representative Town Meeting in March. The board is rebuilding the budget and will present it to Town Meeting members for final approval on June 2. Many audience members attended the meeting to show their support for keeping the town’s animal control officer position. 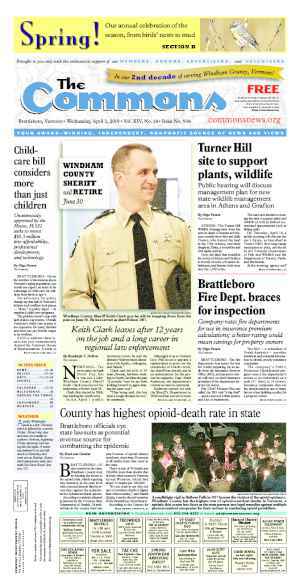 Representatives of the Windham County Humane Society (WCHS) highlighted the necessary role the animal control officer plays in protecting the safety of people and animals. “Attached to every animal is a person,” said WCHS Executive Director Annie Guion, who provided the board with information on towns that had turned the animal control officer position into a self-sustaining revenue generator. Carolyn Conrad, WCHS director of operations, said that a high correlation exists between the cruelty an individual does to animals and the violence that person will inflict on people. She added that the town’s animal control officer helps intervene in situations where individuals engaging in animal cruelty might also pose a risk to people. At the suggestion of Police Chief Eugene Wrinn, the board voted to cut the animal control officer’s weekly hours from 40 to 30, saving almost $10,000. Wrinn added that the animal control officer answers about 800 calls a year, resulting in about $9,000 in fines. The board also voted to cut interest payments on the second Police-Fire Facilities Upgrade project’s $9 million bond, realizing $261,473 in savings. “There are significant questions at present with what’s going to happen with the police-fire facilities [project],” said Gartenstein. Gartenstein said that the board will reconsider that $14.1 million project after the town budget vote in June. He hoped the project would return to a public process. If it does, he said, he intends to take additional public comment. The board voted against $27,406 in department-specific budget cuts. Most of these cuts would have reduced staff salaries and equipment costs in departments already hit by previous budget reductions. When asked why she chose to reduce funding to process land records, Town Clerk Annette Cappy said that it was either land records or department salaries. Only the non-union employees would have received the pay cut, she said. Of the approximately 150 town employees, 30 are non-union. These non-union employees are mostly the lowest paid and mostly women, Cappy continued, adding that cutting their already-low salaries should not be an option. The board preserved $600 to pay American Sign Language interpreters to translate public meetings. Brooks Memorial Library will cut $6,185 — 1 percent of its operating budget — by reducing operating expenses. At this stage it seems positions and operating hours will remain. Recreation and Parks will take a $2,000 cut to cemetery maintenance and propane rather than lose 1 percent of its budget, or $8,000. The Fire Department reported it saved $18,311 by replacing two retired firefighters with new hires who will receive less in benefits. As well, the department is holding off on retirements anticipated for fiscal year 2015, thereby heading off related expenses such as vacation buy-backs. Town Meeting Member Spoon Agave asked if the board members would also take a 1-percent cut in their stipends. “It’s not much, but we are nickel and diming here,” said Agave. Conversation between the board and audience turned heated at times. As well, apologies were offered from both sides. The heated conversation included Town Meeting Member Lynn Russell, who, in a misunderstanding, took the board to task over what she believed was a $13,500 raise for Director of Public Works Steve Barrett. In fact, Gartenstein said, Barrett was receiving a 1 percent cost-of-living raise of about $800. Russell attempted to apologize to Gartenstein, who said the apology was due Barrett instead. Former board member Dora Bouboulis chided the board for taking its frustration out on citizens. She told them that if there was any misunderstanding it was because the board wasn’t doing its job. Audience member Terry Carter said that Gartenstein had made a patronizing comment to her. Selectboard Vice Chair Kate O’Connor said she felt the need to respond to Carter and Cain’s comments: as a woman, she said, she had never experienced gender bias from the male members of the board. 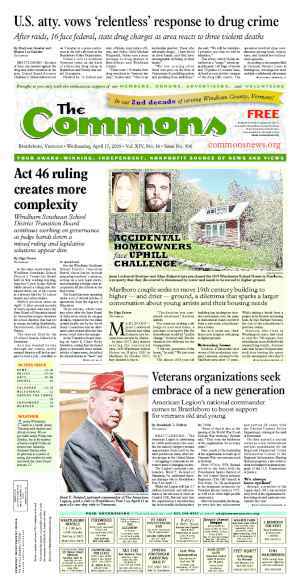 The added vitriol provided little to no additional progress in addressing Brattleboro’s high property taxes. Originally published in The Commons issue #254 (Wednesday, May 14, 2014). This story appeared on page A1.